As all the uses of “allegedly” in the previous paragraph indicate, I’m a Lei Feng cynic, like many others in China. I assume that his “diary” is simply a piece of propaganda composed by some Party ghostwriter when Mao decided to embark on a campaign designed to revive his base of popular support after the Great Leap Forward famine of the late 1950s. But fake or not, Lei Feng was important and continues to be held up by the CCP as a model citizen whom others should emulate. Today, he’s also a kitschy pop culture icon whose portrait adorns t-shirts and messenger bags purchased by tourists in places like Shanghai’s Pearl Market. 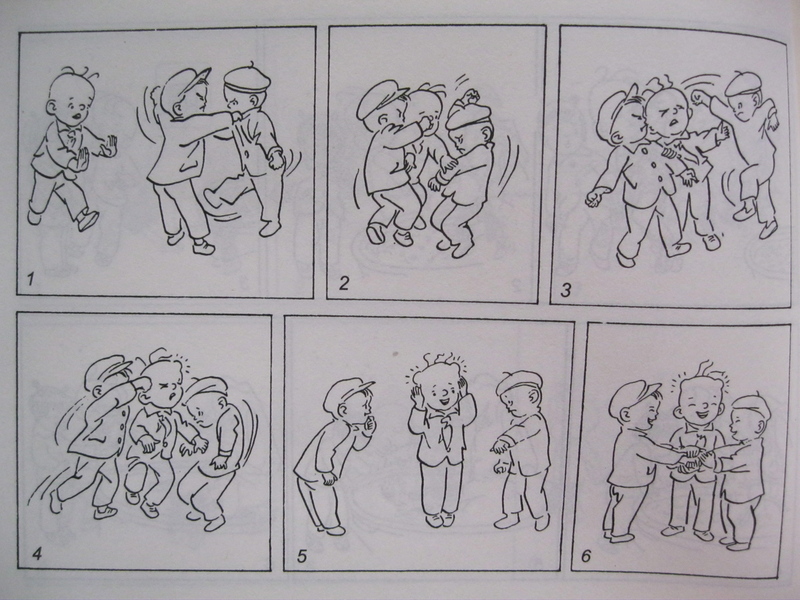 Lei Feng intersects with my interest in the Sanmao comics drawn by Shanghai artist Zhang Leping. Sanmao Learns from Lei Feng is not Zhang’s most famous work, nor is it his best. 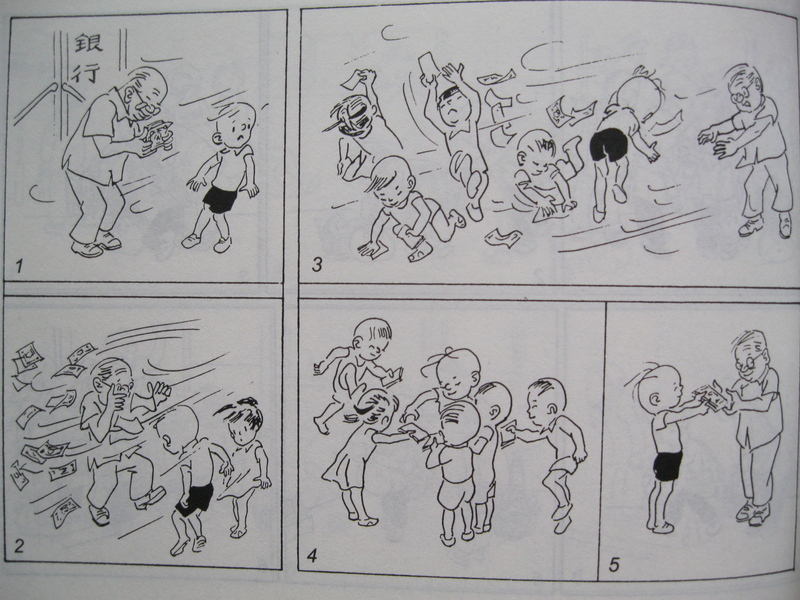 Like Zhang’s other Sanmao comics, it stands as a sign of the times: between 1935 and his death in 1992, Zhang repeatedly re-invented the Sanmao character to reflect political trends and/or social issues. Sanmao Learns from Lei Feng didn’t come out until 1977, after both Mao and the initial Lei Feng fervor had died, and it’s just one of many shorter Sanmao collections that Zhang drew in the post-Cultural Revolution era. But it gives you an idea of the types of acts small children were supposed to perform as they mimicked the example of Lei Feng. 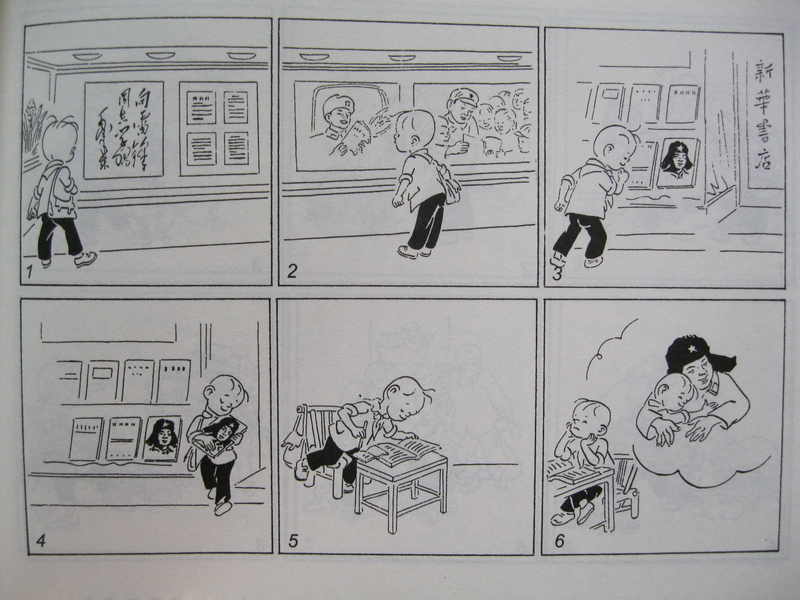 I’ve picked a few panels to share here. 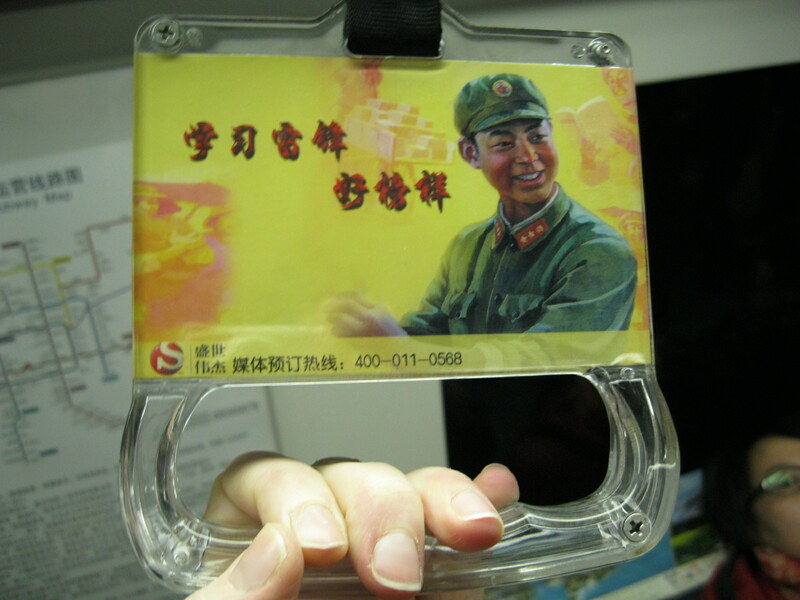 May they inspire you to observe Learn from Lei Feng Day in appropriate fashion. 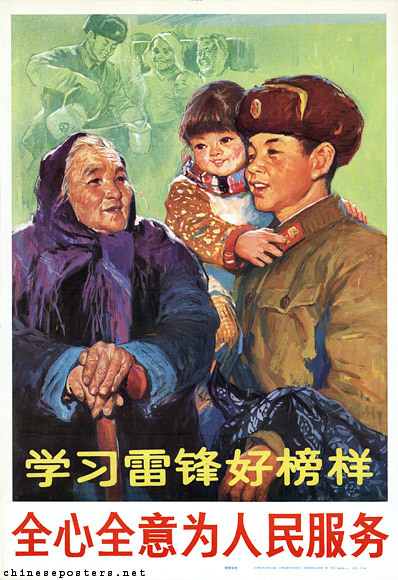 Sanmao sees posters promoting the Learn from Lei Feng campaign. He buys Lei Feng’s diary and reads it; inspired, he imagines winning Lei Feng’s approval through good deeds. 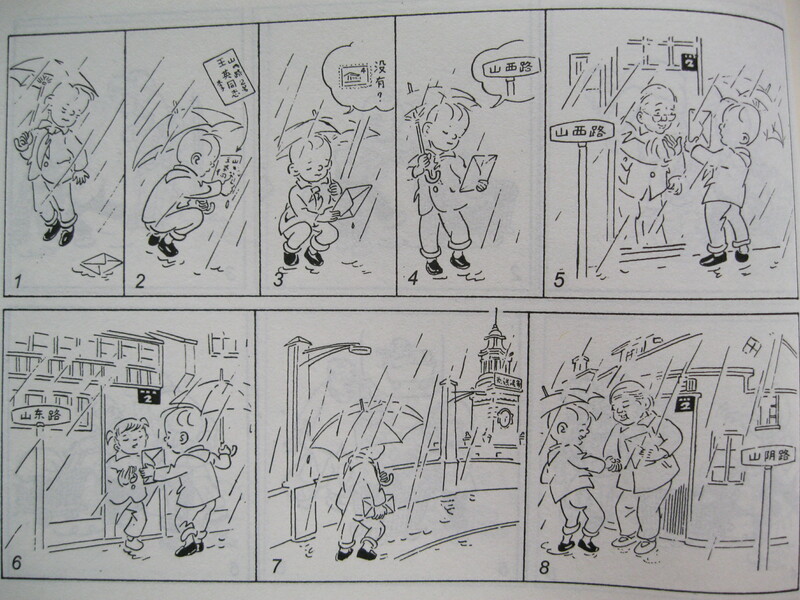 Sanmao finds an unmailed letter on the ground during a rainstorm. The address is partially destroyed: “#2 Shan___ Lu.” He sets off to find the intended recipient. Shanxi Lu? No. Shandong Lu? Not that either. Finally, on Shanyin Lu, success. 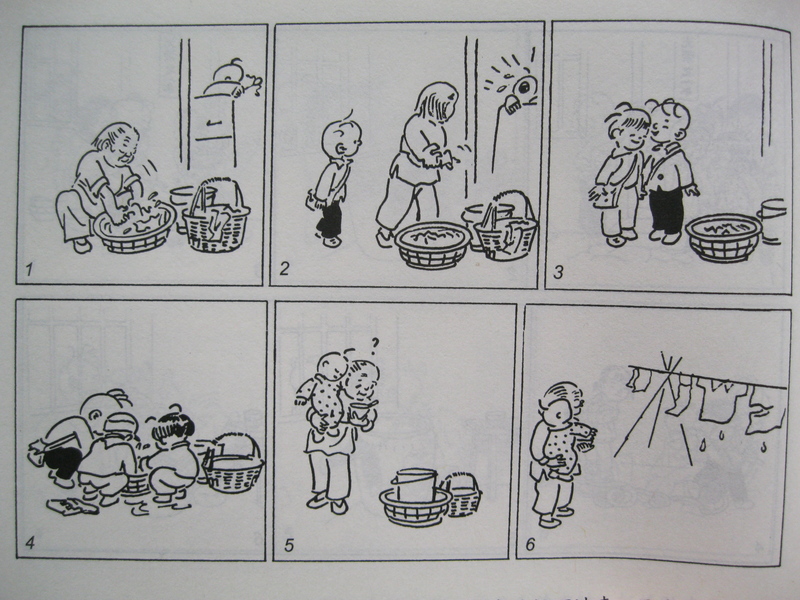 There’s an emphasis on doing good deeds for the elderly—with bonus points if they’re performed anonymously, like in this comic strip showing Sanmao and his friends secretly helping an older woman out with her laundry. Another example of Sanmao and friends helping out someone older, this time when a gust of wind blows money out of the hands of a man emerging from the bank. They run around and collect the cash, returning it to the man without losing a single yuan. But learning from Lei Feng isn’t all household chores and grateful senior citizens. Sometimes it involves real sacrifice and pain, such as when Sanmao tries to break up a fight between two other boys and winds up being the one who gets hit instead. But Sanmao (clearly suffering from a head injury) just laughs. Lei Feng would understand that the boys didn’t mean it. I too hope to be a rustless screw for the revolution!